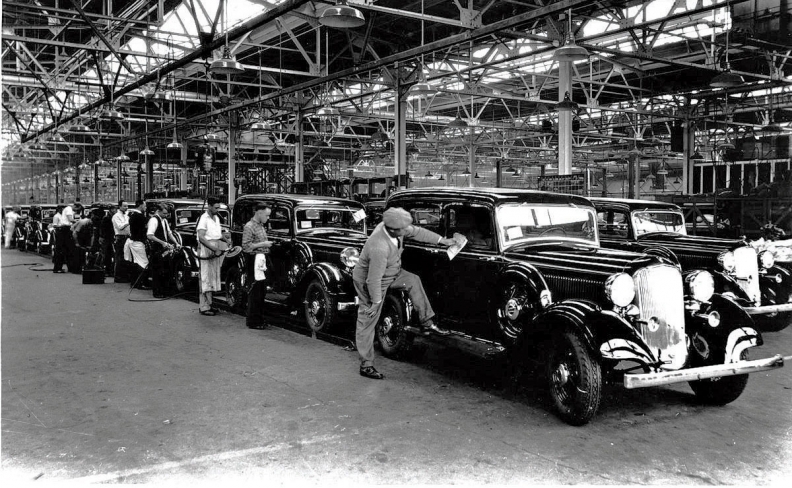 On the final assembly line in Windsor, Ontario, 1933 Dodges headed to a recovering market after the 1929 stock crash. As temperatures outside a packed Chicago banquet room plunged into the single digits on Jan. 30, 1934, a gifted speaker warmed up the audience inside. "The New Deal, with a greater measure of social and economic justice, is breaking down our feudal system," proclaimed James Dalton, the editor of Motor magazine and the keynote speaker at NADA's annual meeting. "Dealer yeomen in the mass are climbing closer to equality with the factory barons." The National Recovery Administration's code for motor vehicle retailing, which defined fair practices and imposed strict minimum prices, had curbed rampant undercutting and put auto retailing "on a sound foundation for the first time since Alexander Winton sold the first automobiles commercially in 1898," Dalton said. As unlikely as such an address might seem to a reliably Republican audience, the assembled dealers listened intently as Dalton described legislation approved in the first 100 days of Franklin Roosevelt's presidency in 1933 as "the Magna Carta" of their liberties. "Yours is becoming a legitimate business instead of a racket," Dalton told the dealers. "Soon there will be no place among honorable merchants for those who are racketeers by instinct or who cannot break the habit." Dalton urged his audience to remain vigilant against unscrupulous and unreformed dealers who violated the federal code. "Violators are lawbreakers and they must be treated as such," he thundered. "Traitors, snipers, chiselers and weaselers must be rooted out. If any of them offend persistently and wantonly, send them to jail where they belong." Dalton's speech, reprinted in the NADA Bulletin, sounds strident to modern ears. But such passion was common during the Great Depression. After the stock market crash in October 1929, the U.S. economy collapsed, bottoming out in 1932. For high-flying U.S. automakers used to virtually continuous growth -- sales had grown in 25 of the first 29 years of the century, peaking in 1929 -- the crash was calamitous. Consumers were opting to defer new-car purchases. Sales fell 71 percent in three years, from 4.34 million vehicles in 1929 to 1.26 million in 1932. The 1929 peak proved so unsustainably high that U.S. light-vehicle sales would not match that level until 1949, when they reached 5.6 million. Idle production capacity placed both automakers and dealers in a strategic bind. Auto making is highly capital-intensive. Manufacturers must use the economies of scale they achieve by keeping factories busy to reinvest in designing and developing fresh products. By 1932, most dealers were losing money on both new and used vehicles. Even NADA was in financial straits; its membership plummeted to 2,000 dealers, and most of them were behind in their dues. In May 1932, NADA cut staff at its St. Louis headquarters by three employees, the Bulletin reported. President Floris Nagelvoort of Seattle agreed to pay for his own NADA office space to spare the association's depleted coffers. That fall, Roosevelt was elected in a landslide. After he took office in January 1933, the ailing auto industry became a key component of his New Deal, addressed through the National Industrial Recovery Act and the National Recovery Administration. Roosevelt's whirlwind program included the creation of codes of conduct for specific industries and trades. The National Recovery Administration established rules for more than 400 lines of business, but the first code to be completed and enacted was the Code of Fair Com-petition for the Motor Vehicle Retailing Trade. The code set strict rules for vehicle production and retail pricing. Manufacturers could not make more vehicles than their allotment. Auto retailers could not sell new vehicles for less than set minimums, and they could not buy used cars for more than a set maximum price. The trade-off for this government price-fixing was a setting of minimum wages for different employee classifications: 20 to 45 cents an hour, with a maximum work week of 35 to 45 hours. As he hit the economy's reset button, Roosevelt described the spirit of the National Recovery Administration in June 1933: "If all employers in each trade now band themselves faithfully in these modern guilds -- without exception -- and agree to act together and at once, none will be hurt and millions of workers, so long deprived of the right to earn their bread in the sweat of their labor, can raise their heads again. "The challenge of this law," the president stated, "is whether we sink selfish interest and present a solid front against a common peril." Ending the cutthroat race to the bottom in auto retailing could succeed only if everybody complied. Enforcing the federal retailing code was critical. Administering the code was F.W.A. Vesper, the incoming president of NADA, who was back for a third term in the job after serving in 1918 and 1919. NADA was created by auto dealers who opposed government regulation, but after the brutal sales chill of 1932, dealers welcomed federal intervention. It worked. U.S. auto sales recovered strongly in 1933, rising 37 percent to 1.7 million units, followed by another jump to 2.3 million in 1934. The fortunes of dealers and NADA revived as well. By 1934, NADA membership had sharply turned around from two years earlier, reaching 30,000 paid-up dealers. The Aug. 10, 1934, NADA Bulletin featured a front-page column labeled "a personal message by President F.W.A. Vesper." Its headline: "Enforcement Is Every Dealer's Responsibility." Vesper took a hard stance on living by the code, comparing violators to a famed gangster. "It took all the police machinery of the nation quite a long time to enforce a very well established and unanimously popular law against John Dillinger," Vesper wrote. "Others of his ilk are still at large." The same issue reported legal proceedings against code violators, including Gordon Harris, "the leading discounter in New York City," who was fined $50. It noted the indictment of Chicago Uptown Motors Corp. on eight counts of overpaying for used cars and cutting list prices on new autos. 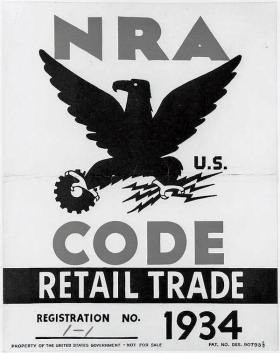 The U.S. Supreme Court declared the National Recovery Administration and its commercial codes unconstitutional in 1935. But one part of its legacy lived on for dealers: At the urging of the agency, which sought reliable data in setting prices, NADA in 1933 started publishing its Official Used Car Guide, based on a survey of member dealers. By the spring of 1935, Vesper was returning to a standard NADA theme: pushing factories to restore dealer margins to a level that would allow them to reinvest in their stores. "We must restore these to a point where a dealer can realize a fair margin on his investment," Vesper editorialized in the Bulletin. That issue announced another Vesper initiative: a special trade survey, to be audited by the accounting firm Ernst and Ernst and sent for study to the National Recovery Administration "to support NADA endeavors to obtain proper profit for dealers." The NADA survey data helped support a later report on "overdealering" by Leon Henderson, the director of the National Recovery Administration's research and planning division. Henderson concluded that the 36,000 auto dealers then maintained by manufacturers were too many. "There is strong evidence of an excessive and uneconomic number of authorized dealers," Henderson said. "This portion of the industry finds itself in a distressed condition." At the same time, Vesper pushed all automakers to tell their field representatives to stop urging dealers to discount cars, against the code. In 1935, the Bulletin reprinted a response from General Motors' president, Alfred Sloan Jr., agreeing with NADA's position on a "liquidating damages contract." That November, Jack Frost, assistant to the NADA president, was promoted to general manager. Vesper stepped down and announced that NADA's headquarters would move to Detroit from St. Louis. The 1936 NADA president, E.M. Lied of Omaha, elevated Frost to executive vice president. Lied chaired the committee that secured a new home for NADA in Detroit, ultimately deciding to lease a floor in the Statler Hotel. Even as the country emerged from the Depression, franchise agreements that favored manufacturers over dealers continued to impose financial pressure on most retailers. U.S. Rep. Gardner Withrow, a Wisconsin Progressive, called for a congressional investigation of factory-dealer relations in 1937. Citing a 25 percent annual turnover in auto dealers nationally, Withrow charged that manufacturers were taking advantage of their retailers by forcing them to buy cars they didn't want, which ultimately harmed consumers. In a national radio address on July 20, 1937, Withrow cited NADA surveys showing that the average U.S. dealer lost $8.59 for every new car sold. He compared that to 1936 annual reports for public automakers: GM made $127 per vehicle sold and Chrysler $97. Even tiny Nash made $22 per vehicle. "The manufacturer, to increase his volume of production, often forces his dealers, under the implied threat of canceling the dealers' franchise, to accept and pay cash for an unreasonable amount of new cars and accessories that both know must be disposed of at an ultimate loss to the dealer," Withrow said, according to the Bulletin. "This factory pressure also leads to price-cutting, over-allowances [on trade-ins] and packing the financing charges," he added. Withrow got his investigation, but failed to secure a national auto dealer franchise law. Eventually, NADA and dealers sought state-level franchise agreements. But the number of new-car dealerships competing with each other throughout the 1930s, growing from 34,069 in 1934 to 47,133 in 1941, hampered dealers' ability to work together to counter manufacturers' power. In 1996, Automotive News spoke with Iowa dealer Warren McEleney, who had been NADA's president in 1971. McEleney said working in the more-consolidated industry of the 1990s made it easier for dealers to cooperate on industry issues than during the Depression. "Dealers [then] were not as cohesive as they are today," McEleney said. "There were so many automakers."